Golf is recorded in Dunbar as far back as almost 400 years. In 1617, just a few miles west of the town, one of the very earliest of golf references shows “gouffers” breaking the Sabbath laws and being reprimanded by The Kirk. In 1794 the first golfing organization is recorded when a body known as The Dunbar Golfing Society set down its rules and listed 27 members. This Society played at West Barns Links (near today’s East Links Family Park). A framed copy of the rules hangs at Dunbar Golf Club clubhouse today. Sadly no further record of them survives and soon afterwards the West Barns Links were taken over for Napoleonic military training and exercises. In the ornate script of John Jaffray, the first Club minute records that on Saturday, December 20 1856, having hired the Town Hall at a cost of one shilling, six gentlemen formed the Club. A military captain, George Warrender of Lochend, aged 31, chaired the founder members; George later became the 7th Baronet of Bruntsfield. The other five founders were Captain James Cox of the Berwickshire militia, Lt. John Stewart, William Anderson, James Brand and Jaffray. The prevalence of these military titles is unsurprising; Dunbar was then a major garrison town. The first course required “clearing of the ground” and this suggests there was no pre-existing course. The Club’s meagre finances prevented them from hiring a course architect so it was simply set out on the ground as it lay. Only 15 holes were laid and sited seaward of the large wall visible today from the clubhouse. The course became known as Broxmouth Links, or East Links. In these days the three cottages called The Vaults (its ruins stand today by the 7th green) were occupied by large fisher families. A second course of 18 holes (4,701 yards) was set out in 1880. This course turned for home at the current 8th green. A third course of 4,913 yards was set out in 1894 when Old Tom Morris altered seven holes and play was extended to today’s 10th green. A fourth course of 5,740 yards was set out in 1905 when the Deer Park land was used. Today this extra land is occupied by holes 1,2,3 and 18. 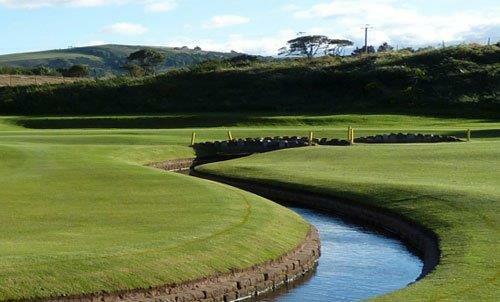 Finally, in 1922-24, famous golfers James Braid (five times Open champion) and Ben Sayers of North Berwick laid out the course we largely play today, lengthening it to 6,425 yards. In 2008 the course was further extended to 6,597 yards.